Aydon Castle is one of the best examples of a medieval manor house in England, which has managed to remain almost unchanged throughout its nearly 800-year history. 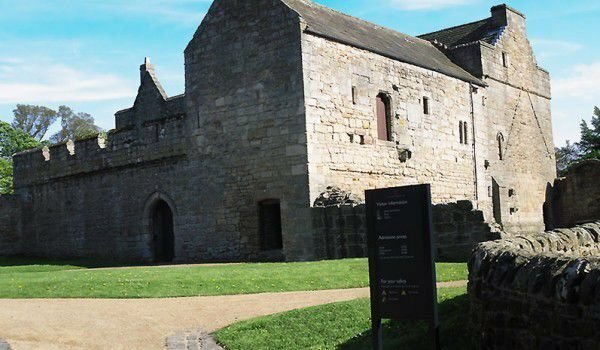 Aydon Castle is beautifully situated amongst woodland in a secluded corner of Northumberland County. The picturesque area of the mansion is located just one mile distance to the northeast of the town of Corbridge. The foundations of Aydon were laid in 1296 by Robert de Reymes, who was a rich merchant from Suffolk. Reymes began to build his mansion in a quiet and unusually peaceful spot between the surrounding areas. Castle Aydon is naturally protected by thick forests on the one hand, but the rest of the building was not particularly well fortified. Robert de Reymes unfortunately had no luck to be able to finish the castle in peacetime. Soon after starting work on his new mansion, conflict arose with Scotland, and local areas fell under the raids of the Scots. In 1305 the trader obtained a license and permission to strengthen the defensive structure of his fortress, building fortifications and putting chains on the outside walls of Aydon. These additional defenses, however failed to stop the Scots in their raids once in 1315 and again - in 1346. The fate of Aydon was to be transferred from owner to owner, many of its holders generally lived elsewhere, but left the property for rent. This largely enabled the initial construction of Aydon castle to remain essentially unchanged. The only significant changes in the architecture of the mansion Aydon were made during a repair in the mid-16th century, when the castle was transformed into a farm. Aydon castle was used as such until 1966 and after that year, it became state property, being restored to its authentic medieval appearance. Today the castle Aydon is open to the public almost throughout the year, with a small entrance fee, providing parking and special equipment for people with disabilities.